Egypt and Saudi Arabia are vital for the security in the Arab region, Egypt’s President Abdel-Fattah al-Sisi said on Thursday. 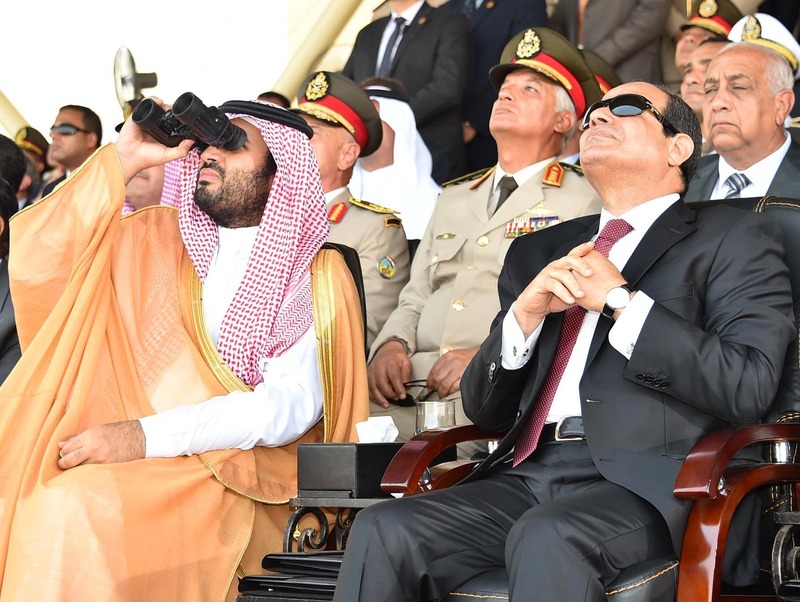 The two allies, who are partners in the kingdom-led coalition striking Houthi militias in Yemen, are the “wings of Arab security,” Sisi told graduates of the military academy. Saudi Deputy Crown Prince Mohammad bin Salman, who also serves as defense minister, was also at the ceremony. Sisi added that the deputy crown prince’s presence at the ceremony sent a “strong message” of cooperation to their people. “You will not see us but together,” state-owned paper al-Ahram reported him as saying. Since the ouster of Islamist President Mohammad Mursi in 2013, Saudi was quick to back Sisi, seeing him as a bulwark of regional stability. On the same day, Saudi Arabia’s foreign minister and his Egyptian counterpart expressed their keenness to further develop relations between the two countries, dubbed key to regional security. Egypt’s Foreign Minister Samih Shoukry described “solidarity” between Cairo and Riyadh as important to protecting regional security in a joint press conference with Saudi’s top diplomat Adel al-Jubeir. Jubeir said Riyadh is keen to further develop its relations and cooperation with Cairo. He also said communication is continuing with Egypt to build a unified military Arab force. In March, Arab foreign ministers met Egypt and agreed to establish a unified military force for rapid intervention to deal with security threats to Arab nations, including Islamist militants who have seized large swathes of land in Syria and Iraq. While the ministers agreed in principle, no major development materialized. Secure us than and stop persecuting half of the population you don't agree with. Stop targeting Muslims too. Almost everything is about targeting Muslims. Bridge the Sunni-Shia divide. The assurance of regional stability hinges on that. As long as the divisions exist it gives the enemies of Arabs something which they can use to create chaos. Building a unified military force [which will hunt down extremists and bring extremist to an end] should come afterwards. The problem is that there are many Shias are not loyal to their countries/people. In simple meaning they are bunch of "traitors" ! Those people are not less dangerous than Daseh. If they had gotten the opportunity, they won't hesitate to carry out the orders of the Iranian Mullahs and destroy the rest of Arab countries like what they are doing in Syria,Iraq,Lebanon and Yemen. Now the Shias in Bahrain are walking in the streets carrying Iran flags and trying to overthrow the regime. Who love Iran should carry his luggage and leave immediately without noise. The fact is those people don't understand the language of peace. They won't shut up till the Peninsula Shield Forces enter Bahrain and teach them a lesson like previous time. Otherwise they will bring terrorism and shame to our countries. Egypt and Saudi Arabia signed a pact in Cairo Thursday aimed at boosting military and economic ties between the two Arab allies. On Thursday, a Saudi delegation led by Deputy Crown Prince Mohammed bin Salman visited Cairo and signed the "Cairo Declaration," also attending a military parade with President Abdel Fattah al-Sisi. "The two sides stressed the need to exert all efforts to boost security and stability in the region, and to work together to protect Arab national security," Sisi's office said after the signing. The "Cairo Declaration" backs building a new joint Arab military force to fight terrorism in the region, according to the Saudi Press Agency. The leaders have also expressed their keenness to further develop relations between the two countries, dubbed key to regional security. Speaking at the ceremony, Sisi said Egypt and Saudi Arabia are vital for the security in the Arab region. The two allies, who are partners in the kingdom-led coalition striking Houthi militias in Yemen, are the “wings of Arab security,” Sisi told graduates of the military academy. Jubeir said Riyadh is keen to further develop its relations and cooperation with Cairo. He also said communication is continuing with Egypt to build a new joint Arab military force . Just curious @ Gasoline. Why do all Shias prefer to align themselves with Iran? In countries with Sunni majorities were they [Shias] discriminated against, treated as second class citizens maybe? Have they any good reasons for being unpatriotic? They don't believe in patriotism or loyalty to their country and people, they are loyal only for the "divine leader" who happens to be Khomeini of Iran. If only for the great influence in religion, Saudi Arabia is a force to reckon with in their zone. It would take ISIS so many times to think about fighting with Saudi Arabia because it is the seat of Islam. And what happens if in case Saudi Arabia would mount a serious raid in Syria and Iraq to drive away the ISIS? I may be wrong but it may end that artificial war waged by ISIS. It's a war against an ideology and I think that military victory over ISIS won't destroy their radical ideology. It must be countered with something better — a better ideology. I'm getting to like Shia's less the more I learn about them. If only it was possible to enact laws that would make it easier to deport such citizens to places where they can serve the Ayatollah's . . . Sorry for being late, I'm a bit busy these days.